The wonderful thing about hiking is that anyone can do it. As long as you can walk (although you do see parents carrying babies in special backpacks) you can take part in it. It’s excellent exercise, and getting out into the country can be the perfect way to refresh the spirit. As we age, though, it often happens that we can’t do quite all the things we did before. Not always, of course, but it really pays to be more aware of our limitations. In many cases, growing older makes very little difference to what we can do, especially in terms of walking. If a person is in good health, especially with no leg or hip problems, and has been hiking for years, then the chances are they can continue as before unless any medical problems develop. Common age related problems are with knees, legs, or other parts of the body, meaning we simply can’t be the people we were at 40. That’s why it’s important to talk to your GP about any limitations they might place on you. Much advice is simply good sense. Hills, especially rough trails, can become more of a problem for older people, so making sure that you’re walking is on flatter paths is quite self-evident. The same applies to distance; you might not be as comfortable covering as many miles as before. While many walk for exercise, it’s worth remembering that it’s never good to overdo exercise. It’s also supposed to be fun. Pushing yourself to your very limits is going beyond enjoyment. Although rambling can be enjoyed alone as a way to appreciate the countryside and indulge in some contemplation, it can also be great fun in groups. 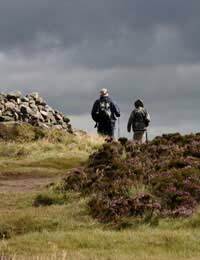 There are many, all over the country, some of them geared towards older people, others catering for all age groups, with walks planned to suit everyone. The social aspect can often enhance time spent rambling. Planning is important. Be sure you have a route and distance that’s comfortable for you, one you can not only accomplish without feeling drained afterwards, but also enjoy while you’re doing it. Walking regularly, even if it’s just for 20-30 minutes a day in your neighbourhood, will help keep you in good shape. As long as you can manage it, it’s something that’s advisable for everyone at least three times a week. It also prepares you for longer rambles on the weekend, or whenever you have the time. Just like anyone else, be sure you have the appropriate clothing and footwear – a good pair of boots is essential. You also need to be very aware of keeping yourself hydrated, so carry plenty of water. Don’t be afraid to break up the walk and take a break if you’re feeling a little tired. It’s not a contest, so stop when you feel like it, rest and drink in the view. Similarly, if you have a day when you don’t feel up to it for whatever reason, don’t force yourself; there will be other opportunities. You know yourself and your body; listen to what it tells you. If you haven’t been hiking before and you’re planning on starting, see your GP first, especially if you have any medical conditions. As long as everything is fine, get out there and enjoy yourself! I looked up the subject of hiking for older people because I need specific information about a foot problem, but I found nothing of use here - so I will post my question. Several months ago I started walking with the intention of going on a long walk in August.I quickly built up my mileage, and in the end was comfortable walking for twenty miles in a day with no ill effects. Then just before I was due to start the long walk, I developed sore spots just behind my toes, and the GP told me that I was injuring the metatarsal bones in my feet, and that I could do serious damage if I was not careful.I postponed the walk, but as yet don't know what I can do to prevent this damage happening again. What I would like to know is, is this an age related problem? and would boot in-soles help?If so, what should I look for regarding in-soles?There seems to be a lot of choice. Do lots of walking for charity and have committed myself to 1000kms in under 30 days in the not too distant future. Apart from changing my mind best prep regime?